Anyone spot the deliberate mistake in this picture? Yes the image stabilisation is switched on, when the camera is on a tripod. I'm being constantly asked as to how various camera / lens combinations work because there is no image stabilisation (IS) on either. 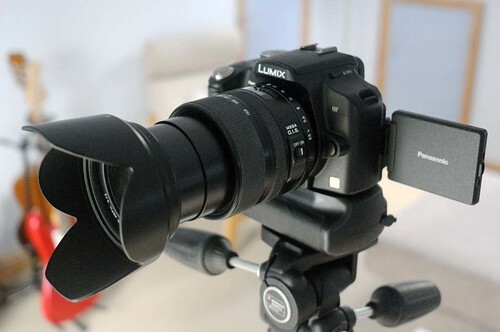 For example using an Olympus m4/3 lens on a Panasonic m4/3 body. There seems to be a belief springing up that it isn't possible to take pictures without some kind of IS system in place. You can buy a Nikon D3X for just under £5000. Add in a 24mm f/1.4 lens at £1650, and maybe a 24-70mm f/2.8 at £1200. You then have a good solid pro outfit. But do you? Since neither the body or lens have any form of stabilisation system, that means they are useless right? Well no of course they aren't. I don't know why so much emphasis is put on this. These IS, VR and OIS systems are there for one reason only, to make it possible to use slightly lower shutter speeds on certain lenses. The old equation on lenses used to be, the slowest shutter speed to use should match the lenses focal length. So 1/20th sec. for a 20mm lens, 1/50th. sec for a 50mm lens, 1/200th sec for a 200mm lens etc. A good stabilisation system should extend this to something like 1/8th sec for a 20mm lens, 1/15th. sec for a 50mm lens and 1/50th. sec for the 200mm lens. Some manufacturers claim slower speeds can be used, up to 4 stops, but I've rarely found this to be true. So how useful is this? Well reasonably useful if you are handholding a camera and lens in a situation where you are shooting something that doesn't move, unless you are looking to deliberately create blur of cause. http://www.digital-slr-guide.com/digital-slr-anti-shake.html which explains when its useful and when it isn't, and more importantly when it works against a sharp image, e.g. when the camera is on a tripod, when you are panning. Photographers haven't always had IS. Cartier-Bresson, Ansel Adams, Richard Avedon et al, all seemed to manage without it. I use it rarely and often have it turned off on the cameras and lenses I have it on. In normal shooting situations, it just isn't necessary. Some systems can also make a picture less sharp if fast shutter speeds are used. Camera manufacturers have realised that people are often just leaving their IS, VR etc. switched on all the time and have come up with systems that switch it off under certain circumstances. Very slow shutter speeds for example, indicate the camera is on a tripod and the camera will switch off the IS system in that situation. There's really no substitute for learning to hold a camera steady. Learning to use flash properly and tripods seem to get forgotten or ignored. The best IS system ever invented is a stable tripod, or a fast lens enabling a fast shutter speed. As with all these technological aids, they are just that, aids. As with most, IS is useful in certain situations and if used when appropriate, can be a help. Is it absolutely essential?, well not for me. Whether a lens has it or not makes little difference to whether I will buy it or not, and it certainly doesn't affect my choice of camera. The Pentax K-5 is the only camera I have with it currently. My Leica M9, and my M-mount lenses have no IS of any kind. Leica users have been managing to take images in low light situations for years without it, and will probably continue to do so in years to come. I'm not saying that IS doesn't have it uses, I was for example very impressed with the Sony A55's Super Steady Shot System for video, even though it did lead to overheating. I've also managed some remarkable shots with the Panasonic 14-140mm zoom, 1/15th. sec at 140mm and pin-sharp, so I do use it. It should however be treated for what it is, an option that can help under certain situations.